Apparently we were traveling with a music critic (BigB). Who knew? Our two-bedroom suite in the Westin Verasa might be the largest hotel room we’ve ever had. I’m serious. The living room and kitchen area seemed larger than our first apartment – with plenty of room for at family of four to hang out in comfortably. The room also had fabulous high ceilings which added to the overall airy, spacious feeling. Just to be clear here, I think one of the biggest challenges for traveling families with hotels is having enough space. The large suites at the Westin Verasa are a huge bonus and one reason why we’d certainly consider returning here. The xbox 360 in the living room got a big thumbs up from BigB. I was impressed at this as an in-room entertainment system option, one which is particularly welcome for families like mine, traveling with tween and teen boys. Murph was thrilled to see that the Westin has selected the product he’s been working on since 2002. The bedrooms themselves are moderately-sized and the decor is simple – possibly even a little too sparse – but it does lead one to focus on Westin’s Heavenly beds which isn’t a bad thing at all. BigB practically fell into his bed. Our two-bedroom suite had two bathrooms, one master, both spacious with piles of fluffy white towels, complimentary Heavenly Bath toiletries and inviting double-headed showers. 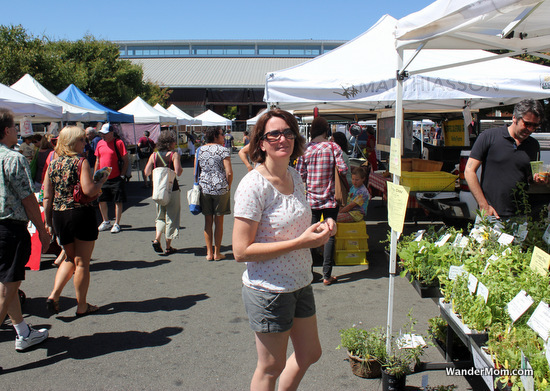 The following morning we walked the short three blocks to the Oxbow farmers market passing the station from which the Napa Valley Wine Train departs and the enticing smells of fresh-baked goodies coming from Model bakery. We stocked up on treats and headed off for a fun day cycling and visiting vineyards. 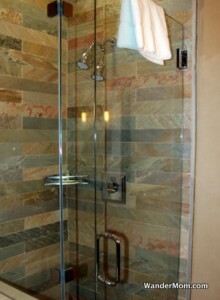 I’m sure there are people who are passionate about the optimal place to stay when visiting Napa Valley. Personally I’ve been here on day trips (from San Francisco), stayed in St Helena which is at the northern end of the valley and now here, in Napa, at the southern end. 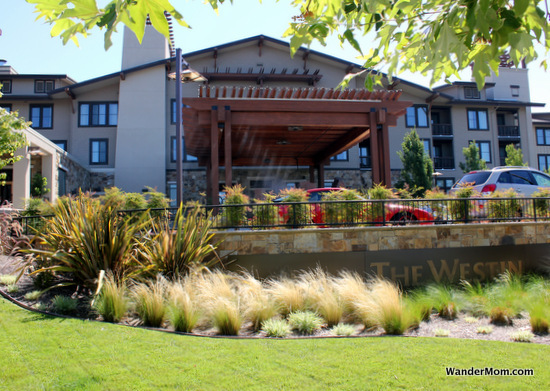 As a weekend visitor, coming from a Bay Area airport and arriving late into the area, the location of the Westin Verasa at the southern end of the valley certainly wins in terms of convenient access. It’s also not so far away that you feel like the drive to wine-tasting rooms in the valley proper is a haul. 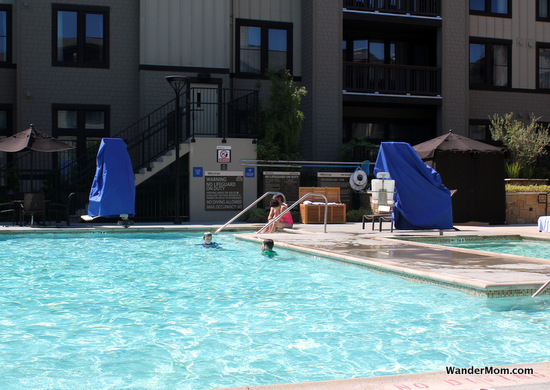 As we relaxed by the pool later in the afternoon, the boys happily playing in the water, Murph and I agreed that the resort feel of the pool area and central courtyard was hard to beat. The Napa River winds through the area behind the hotel giving a pleasant, rural feel to the location. It’s the perfect combination of town and country. Our room opened on to this courtyard. I could imagine relaxing here in the early morning or late afternoon if we return to the Westin Verasa for a longer stay. There’s also a bocce court at one end of this space. That and the ample gym are just a couple of the fitness amenities provided at this hotel. While staying at the Westin Verasa we ate at the Bank restaurant and at the Michelin-starred La Toque restaurant. The food was delicious, imaginative and beautifully prepared using – as you would expect since we were in Napa – fresh, local ingredients. That said the I’ve already almost forgotten the details of the meals but what will stay with me for a long time is the friendliness, professionalism and just plain good fun we had chatting with our waiter at the Bank and the Wine Director at La Toque – particularly the Wine Director, Scott Tracy. We opted for the paired menu and as he served every pour, we were educated about every wine – with embellishments on the story of the people or the vineyard involved. He answered our questions about Napa, the menu, the wines and making wine in Napa with patience and gusto. It made for a fantastic dining (and drinking) experience. My stay at the Westin Verasa was provided by Starwood Hotels as part of the Starwood Hotels LoveYourFamily package, which includes a complimentary suite upgrade, or adjoining room, daily $50 resort credit and an optional SPG Kids Pass program, where at this hotel, you can get all of your kids’ meals for only $16 per child per day with www.spg.com/kidspass Book online, or call 866-716-8147, and reference promotion code FAM50 to make your reservation. 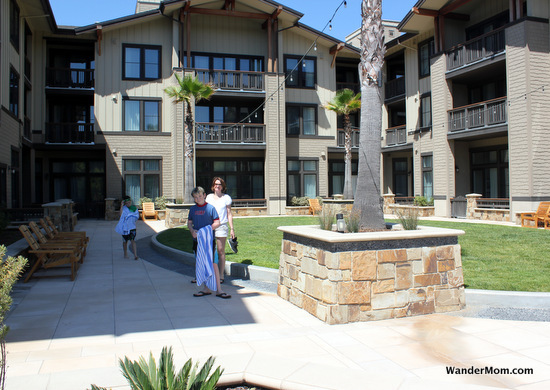 This entry was posted in Advice And Resources and tagged Accommodation, California, Hotel Review, Napa on August 20, 2012 by wandermom. 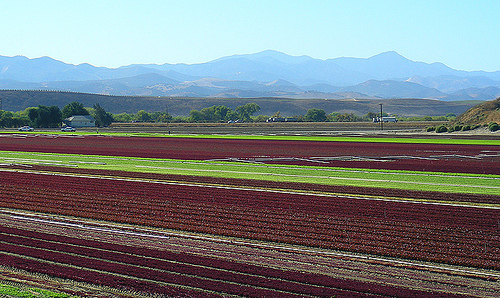 Salinas is hardly a town on the list of must-see attractions in the great state of California. We over-nighted there on our way from Santa Barbara to San Jose simply because it was a convenient stopping point. 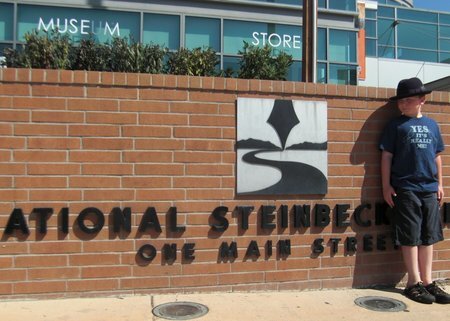 CAM had read Of Mice And Men at school last year so even though we had arrived in Salinas late and weren’t planning to spend much time in the town, we decided (OK, I mandated) that we should take the time to check out the National Steinbeck Center. I really didn’t know what to expect and the boys, with promises of spending a day on the boardwalk at Santa Cruz, were not at all cooperative. 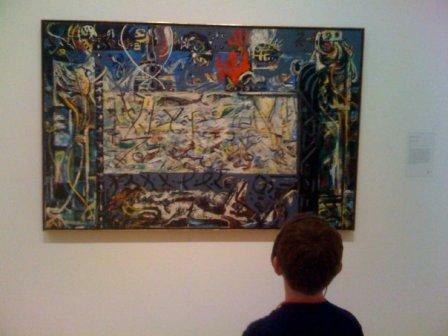 It was a perfect recipe for a disasterous museum visit with children – but we had exactly the opposite experience. The Steinbeck Center is fairly small, but the short movie about his life and the detailed exhibits made the author and his works come alive for all of us. Although my boys were the only children at the museum during our visit, when I spoke to one of the docents he explained that they regularly hosted school groups and it showed in the detailed Treasure Search they provided for the boys to follow as they explored the exhibits. This two-page mostly multi-choice set of questions required the boys to look carefully at many of the exhibits, read excerpts of the books displayed, watch snippets of the many movies based on Steinbeck books and generally learn all about the Depression and the Salinas area as well as John Steinbeck and his work. In the gift shop on the way out, the boys chose a book each: The Grapes of Wrath for CAM and The Acts Of King Arthur And His Noble Knights for BigB. 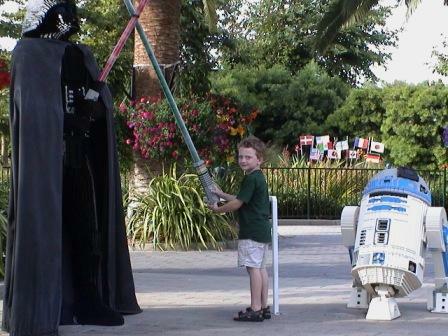 I think you’d agree that’s a parenting high point by anyone’s definition, no? We had a very successful visit to this unassuming small-town museum. If you’re in the area, I highly recommend checking it out – with or without children. And in case a visit to the Salinas Valley isn’t in your future soon, but you think you might pull out your battered copy of Grapes Of Wrath or East Of Eden again the photos below may help you picture Steinbeck’s scenes a little clearer in your mind’s eye. Check out DeliciousBaby for more fun travel-related photos. 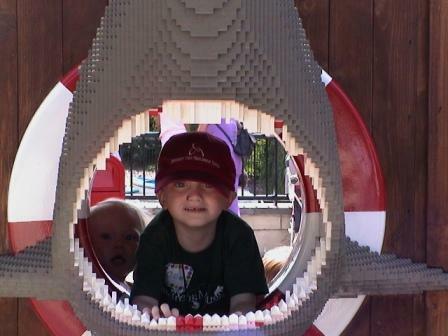 This entry was posted in Kid Travel Photos and tagged California, John Steinbeck, National Steinbeck Center, Salinas on September 24, 2009 by wandermom. 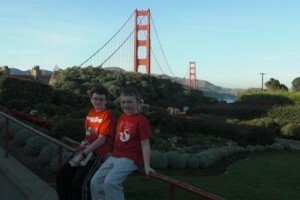 When I posted about visiting San Francisco for Thanksgiving last year, I showed the photos we’d taken of our boys with the Golden Gate bridge in the background on previous trips. This has become a family tradition which we were hoping to be able to continue on this trip. Well, we did get a photo, but from the south side of the bridge – whereas all our previous photos had been taken from the north. The reason why is simple: public transportation. San Francisco has a great bus, tram and train network, which we used every day – and found easy to use, easy to navigate and cheap. But it was not easy to take a public bus over the Golden Gate Bridge on a Sunday – and still have time to do anything else. We considered compromising on our ‘public transit only‘ goal, but in the end decided that a photo from the other side of the bridge would serve just as well. 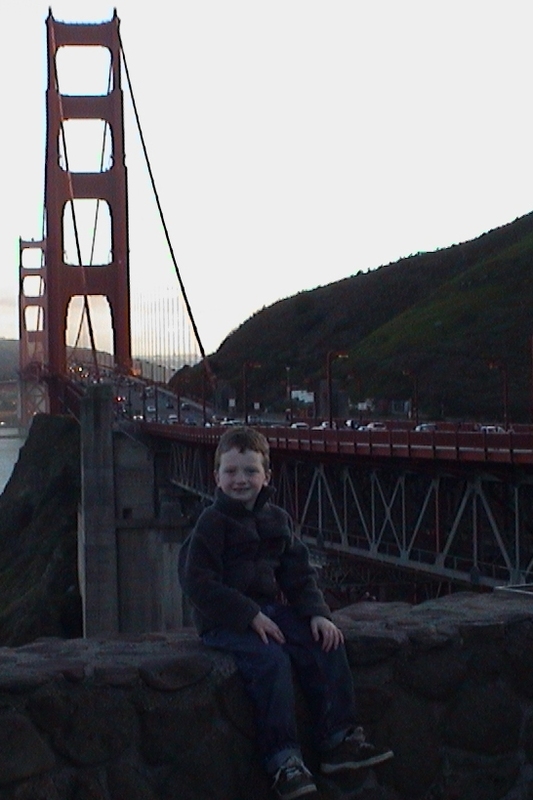 This entry was posted in Exploring North America, Kid Travel Photos and tagged California, Golden Gate Bridge, San Francisco on January 22, 2009 by wandermom. 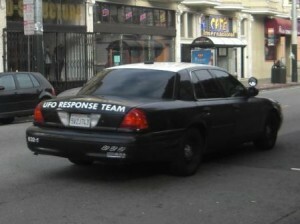 We spotted this while walking along Lower Haight St in San Francisco. CAM and BigB were suitably fascinated and BigB is still young enough to seriously wonder whether it really was a UFO Response Team. This entry was posted in Exploring North America, Kid Travel Photos and tagged California, San Francisco on January 15, 2009 by wandermom. As I said in my previous post, we used public transit for all our transportation needs during our recent visit to San Francisco: buses, trams and rail. But then again, it was San Francisco, so I wasn’t surprised to see some more unusual public transportation options such as this Boat Tram which trundles along Market St. Built for use on the Blackpool sea-front in England, it seems well suited to it’s adopted home. Of course, the “Nowhere in Particular” destination is pure Californian. This entry was posted in Exploring North America and tagged California, San Francisco, SF Muni on December 19, 2008 by wandermom. 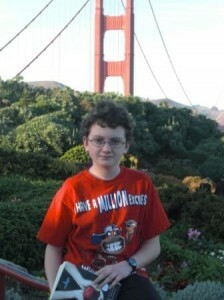 I have a rant and a rave to report from my recent trip to San Francisco. 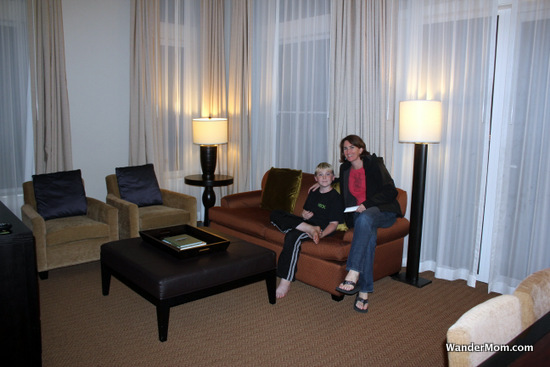 My rave: using Expedia’s package options, we stayed at the Westin San Francisco Market Street. The published rate for our room, a standard room with 2 Queen beds is $329/night. We paid about $110/night. Not to bad, eh? This four-star hotel is beside the Yerba Buena Center for the Arts, with SFMOMA just a block away – much better than staying in the busy neighborhood around Fisherman’s Wharf. Inspired by Debbie’s stories of her visits to the Georgia O Keefe Museum in Santa Fe and the Chicago Art Institute with her preschoolers, I felt compelled to try out visiting SFMOMA with my (older, much more boisterous) boys. It was a huge success. My rant: wireless internet access in the hotel was $14.95 per day. This is an absolute rip-off. Refusing to pay such ridiculous rates, I missed out on Photo Friday last week, but I’m glad to be back this week. Check out more fun and interesting travel photos and travel tales at DeliciousBaby. 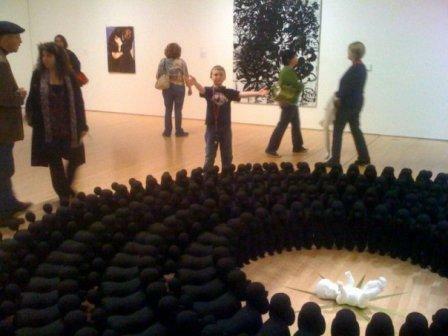 This entry was posted in Advice And Resources, Exploring North America and tagged Accommodation, California, Hotel Review, San Francisco, SFMoMa, Westin San Francisco on December 4, 2008 by wandermom. 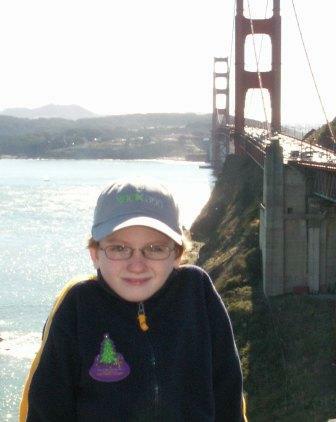 This entry was posted in Exploring North America and tagged California, Golden Gate Bridge, San Francisco on November 14, 2008 by wandermom. 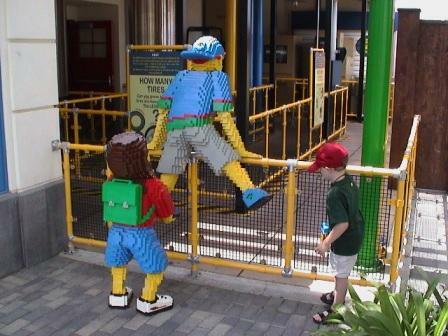 This entry was posted in Exploring North America and tagged California, Legoland on October 3, 2008 by wandermom.